Last week I talked about Google’s Global Cache, and how they will be housing this new project at Internet Exchange Points (IXP). A quote from Wikipedia’s definition explains the importance of IXPs best. Most of these are found in the capital of the country, but not always. For instance, iBiX is located in Ibadan, Nigeria not Abuja and Tanzania has two IXPs, one in Arusha and one in Dar es Salaam. There seems to be a definite advantage to having an IXP located in your country. Why then do so many African countries not have one? From my understanding, it isn’t cost prohibitive to create an IXP or to maintain it. 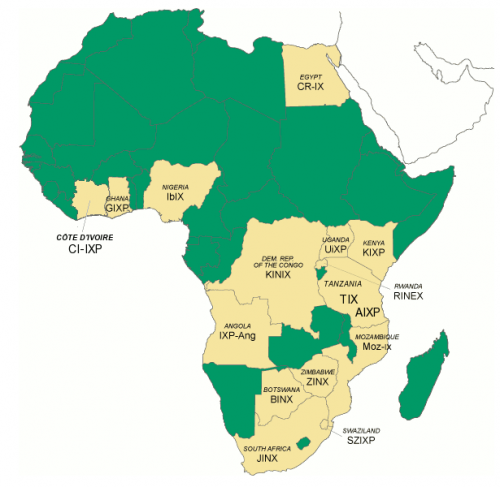 Why would so many African nations, who all have local ISPs, not have a local IXP? “Most of the reasons that countries dont have IXPs are non-technical and are either policy or politics. For instance in Senegal, Sonatel the Senegalese Telco operates in a monopolistic environment. There are almost no ISPs that exist there and those that do just resell ADSL links for the telco. In such a case, they own no infrastructure or services outside what the telco provides. Therefore, there’s been no need/demand for such. A similar case exists in Ethiopia. In other countries like Nigeria, its getting the players to agree and look beyond the mistrust and competitive advantages that others have to form one. That takes a while. FYI, the capital of Nigeria is now Abuja, not Lagos. Lagos hasn’t been the capital in over 18 years. Great blog btw, I am an avid reader. Thanks for catching that Alan. Fixed. I wonder why the other African governments don’t take any decision on this as it would mean, as far as I understand it, very cheap ways of communications. I understand they have other urgent matters to solve, but again communications, phone, mobiles, emails it’s something almost everyone needs for his/her own work. Whats the story behind the two IXPs in TZ? Does it have anything to do with the TTCL telecom incumbent being closed-minded? Just that they needed one in Arusha because of its position as a development hub?